Book Five: “When the battle with the hive ended in flames, the village Oneness expected to pick up life where they left off. But fire does not leave anyone unscathed. Haunted by images of the fire and desperate to know the truth about her destiny, April wrestles with inner demons that threaten to cut her off from those she loves most. Meanwhile, Andrew Hunter faces the reality of life with a wife and daughter he does not know–a wife whose resurrection has made her more than a stranger to him. Six hundred years before, Teresa is equally embattled as questions of life, death, and revelation bring her to the edge of the greatest war of all: the war for humanity’s soul. My Review: I received the first two books as a gift and right of the bat knew this was some good writing. The characters are fleshed out and flawed, just the way I like them. Though at first I struggled with talk of “the Spirit” and nothing about God, Church, or Jesus. So I read the information about the author and ordered (paid for) the rest of the series. I am glad I did. The books unveil more about where their power comes from and how the enemy got such a strong hold in some lives. These remind me of Ted Dekker and Frank Peretti’s writings. And now that I am finished with all five of them, I am sad to say goodbye to the characters I came to know. There is fighting (with demons) and some content that I think make these best suited to ages 16 and up. I do believe they are written for YA crowd, yet I m 52 and loved them. I give the complete series 5 stars. About the Author:Rachel Starr Thomson is in love with Jesus and convinced the gospel will change the world. Rachel is a woman of many talents and even more interests: she’s a writer, editor, indie publisher, singer, speaker, Bible study teacher, and world traveler. The author of the Seventh World Trilogy, The Oneness Cycle, and many other books, she also tours North America and other parts of the world as a speaker and spoken-word artist with 1:11 Ministries. Adventures in the Kingdom launched in 2015 as a way to bring together Rachel’s explorations, in fiction and nonfiction, of what it means to live all of life in the kingdom of God. Rachel lives in the beautiful Niagara Region of southern Ontario, just down the river from the Falls. She drinks far too much coffee and tea, daydreams of visiting Florida all winter, and hikes the Bruce Trail when she gets a few minutes. A homeschool graduate from a highly creative and entrepreneurial family, she believes we’d all be much better off if we pitched our television sets out the nearest window. Rachel began writing on scrap paper sometime around grade 1. Her stories revolved around jungle animals and sometimes pirates (they were actual rats . . . she doesn’t remember if the pun was intended). Back then she also illustrated her own work, a habit she left behind with the scrap paper. Rachel’s first novel, a humorous romp called Theodore Pharris Saves the Universe, was written when she was 13, followed within a year by the more serious adventure story Reap the Whirlwind. Around that time, she had a life-changing encounter with God. The next several years were spent getting to know God, developing a new love for the Scriptures, and discovering a passion for ministry through working with a local ministry with international reach, Sommer Haven Ranch International. Although Rachel was raised in a strong Christian home, where discipleship was as much a part of homeschooling as academics, these years were pivotal in making her faith her own. At age 17, Rachel started writing again, this time penning the essays that became Letters to a Samuel Generation and Heart to Heart: Meeting With God in the Lord’s Prayer. In 2001, Rachel returned to fiction, writing what would become her bestselling novel and then a bestselling series–Worlds Unseen, book 1 of The Seventh World Trilogy. A classic fantasy adventure marked by Rachel’s lyrical style, Worlds Unseen encapsulates much of what makes Rachel’s writing unique: fantasy settings with one foot in the real world; adventure stories that explore depths of spiritual truth; and a knack for opening readers’ eyes anew to the beauty of their own world–and of themselves. In 2003, Rachel began freelance editing, a side job that soon blossomed into a full-time career. Four years later, in 2007, she co-founded Soli Deo Gloria Ballet with Carolyn Currey, an arts ministry that in 2015 would be renamed as 1:11 Ministries. To a team of dancers and singers, Rachel brought the power of words, writing and delivering original narrations, spoken-word poetry, and songs for over a dozen productions. The team has ministered coast-to-coast in Canada as well as in the United States and internationally. 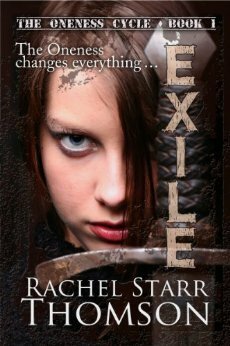 Rachel began publishing her own work under the auspices of Little Dozen Press in 2007, but it was in 2011, with the e-book revolution in full swing, that writing became a true priority again. Since that time Rachel has published many of her older never-published titles and written two new fiction series, The Oneness Cycle and The Prophet Trilogy. Over 30 of Rachel’s novels, short stories, and nonfiction works are now available in digital editions. Many are available in paperback as well, with more released regularly. The God she fell in love with as a teenager has remained the focus of Rachel’s life, work, and speaking.